In November 2015, the City Attorney’s Office conducted an audit and found 98 criminal cases were mishandled. 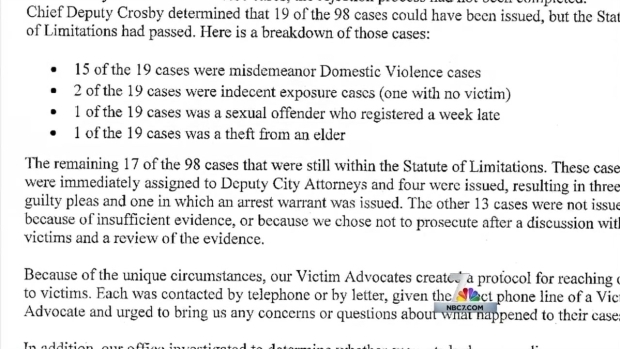 Nineteen of the 98 cases had expired under the statute of limitations. The majority of those were domestic violence cases. Because of what happened in the City Attorney's office, some people accused in those domestic violence cases will never be prosecuted. The missed cases spread from 2012 through 2015. Dozens of cases were not prosecuted by the San Diego City Attorney's Office because a deputy attorney missed the deadline to file charges. NBC 7’s Wendy Fry reports. In an internal memo sent to staff Wednesday, City Attorney Jan Goldsmith wrote that the City Attorney's office “investigated to determine whether the suspects had any pending or new cases against them” and said none did. That's not much consolation for Carmel Valley Psychologist Sage Breslin, who works with victims of domestic violence. She said she was "horrified" after hearing of the City Attorneys mishandling of the cases. Breslin hopes this incident will help change the system. She would encourage the victims in these cases to come forward.